David Shrigley is all over the place. Not in a messily scattershot, action painting sort of way, you understand, because this most prolific of artists, who’s about to have his first major solo exhibition on home turf for more than a decade, is quite possibly one of the most stoically self-contained, if wryly amused people on the planet. It’s just that, as well as the exhibition, which collects drawings, sculptures, photographs and animations from the last three years at Dundee Contemporary Arts, Shrigley currently has more projects on the go than you can shake one of his trademark stick-men at. For starters, part of his DCA exhibition is made up of a series of customised posters made in response to a project on his website, whereby anyone with a wedding, party, gig or event could contact him with the details and have one made for free. Finishing up in mid- September this year, 300 were made. On top of this, with a fully-fledged pedigree among Glasgow’s art/music scene(s) already intact, Shrigley is about to release a spoken word album, Forced To Speak With Others . A collaboration with ‘My mate Martin’ as well as featuring two of the cast of BBC Scotland sitcom, Still Game, also contributing to the album is an actress who —again—contacted Shrigley through his website. Then there’s a trio of record sleeve commissions for albums by Arab Strap guitarist and songwriter Malcolm Middleton and Japanese/American avant-power trio, Deerhoof, as well as one for his own opus. There’s also an animation for the opening credits of Young Adam director David Mackenzie’s forthcoming feature film and his regular cartoon for the Guardian’s Saturday magazine, adding to an already bulky back catalogue of books, greetings cards and Tshirts. With all in part or wholely defined by an instantly recognisable shaky-handed doodled scrawl, his public profile, it seems, has never been at such a wonkified premium. Already running in the Art Gallery of Western Australia is Under The Hammer: William Blake versus David Shrigley, in which Shrigley’s sketchbook version of The Book of Job sits side by side with the original metaphysical pop star’s far denser drawings. The day we meet, Shrigley is about to decamp to Paris for a three-week printmaking residency at CNEAI, the biggest print workshop in Europe. He’ll return to the French capital in December for an exhibition at the Yvon Lambert Gallery. Given the three-hour daily French lessons he’s been cramming for the last week, though, minding his language shouldn’t be a problem. Shrigley strikes one as having been a boy with his head permanently in the clouds, and it’s no surprise that the work that’s made him almost famous is made up of a seemingly free association of throwaway one-liners born of Zen haiku absurdism, and has seen its creator cross over from quiet cult hero status to equally quiet mass market media magnate. Of sorts, anyway. Shrigley’s pop star status was typified one lazy Friday afternoon a couple of years back when he gave a talk at Edinburgh College of Art. The sleepified wooden bench lecture theatre had previously played host to pop culture mavericks such as Michael Bracewell and Stuart Home. While both speakers received dedicatedly respectful responses, Shrigley was clearly, and somewhat appropriately, a bigger draw. Every bench was squeezed sardine tight with bodies, and, outside the held-open door, there wasn’t so much a queue as a scrum, as those who couldn’t get in attempted to snakehip their way around, under or over each other lest one of Shrigley’s laconic pearls of wisdom thud their way. Inside, rather than reverent awe, frequent bursts of laughter permeated proceedings as Shrigley moved through his repertoire. With each hangdog punchline, what had morphed from modest lecture into kill-for-a-ticket event resembled less a pre-weekend-starts-here lecture than a Vic Reeves routine. Shrigley wasn’t actually doing anything, mind. But, call it ubiquity, call it crossover, call it fame if we must, he’d adopted a role that resembled something between stand-up comic and the most matter of fact of gurus. He’d also stumbled on an audience prepared to hang on to his every word in a room that felt like an underground comedy club. Like Andy Kaufman or Ivor Cutler, though, Shrigley doesn’t tell jokes. He doesn’t ‘do’ funny, whatever his fanbase might think. Of the tellingly titled confection of vignettes that is Forced To Speak With Others, Shrigley has made an aural equivalent of his text-based pieces turned into a Loony Tunes-style sound cartoon. These off-kilter, often incantatory miniatures owe as much to Cutler or The Liverpool Poets as they do to Arab Strap. Don’ts in particular, a litany of rules and regulations for the genetically twinkly-eyed, resembles the list-based musings by poet and painter Adrian Henri. For long time readers, the voices are never quite as they imagined them, but they recognise the landscape anyway. The novices either get it or they don’t. Some tracks are performed by an actress who emailed Shrigley on spec, saying she wanted to be in his films. Where others might balk at such potential cyber-stalking, Shrigley invited her along to the studio, an experience which ‘worked out brilliantly’. He was similarly contacted by an 18-year old nominee for BBC2’s Folk Musician of the Year, who went on to set to music a group of lyrics that made up a songbook by Shrigley, which had already accompanied a record cover that came without an actual album. Shrigley and the young bard recorded four songs earlier this year. Shrigley’s response to his collaborators is not just generous, but, by remaining instinctively open enough to have his impulses ping-ponged into action by external influences, he appears to be testing himself as much as keeping amused. Despite such fripperies, Shrigley won’t be sidelined as a voguishly throwaway novelty. For all his multitude of projects and the array of fan boys and girls who hang on his every laterally dashed off bon-mot, Shrigley remains diffident towards much of his canon. In his studio, Shrigley has created an animation for the opening credits of David Mackenzie’s forthcoming film, Hallam Foe . An adaptation of Peter Jinks’ Edinburgh-set novel, the one-minute clip looks jauntily at odds with the film’s theme of voyeurism and revenge. Set to a soundtrack of Orange Juice’s ‘Blueboy’ (this may change, as Franz Ferdinand are apparently ‘doing something’), at first glance it actually more resembles a 21st century The Good Life or The Cuckoo Waltz . Shrigley has also been laboriously transcribing the film’s closing credits in his own trademark scribble. He’s spent two hours on it already, and reckons another three should crack it, but is having occasional yoga breaks, leaning hard in on the bedroom doorframe, to keep the RSI at bay. Over by the record player, a box of limited edition 12-inches of Forced To Speak With Others sits, a garish pop-eyed monster snarling out from the cover. Shrigley insisted the record company do vinyl as well as CD. Another lifetime ambition sorted. Shrigley puts on a CD compilation by a band called Dead Moon. Such is the music’s rough-hewn garage thrash, it sounds like it could’ve been recorded at any point between 1967 and 1977, but actually dates from 1989. Shrigley observes that Dead Moon sound cut from the same cloth as Rocket From The Tombs, the mid-1970s Cleveland band who spawned the skewwhiff art-punk of Pere Ubu. Next, he puts on a seven-inch sent to him by artist and writer Pavel Buchler. It’s a cut-up reworking of sorts, of John Cage’s 4”33, and seems to consist of the sound of Buchler putting the needle on particularly scratch-laden vinyl copies of Cage’s own back catalogue. ‘I’m going to do a concept,’ Shrigley murmurs. ‘It’s going to be called Ding Dong. You can work that one out for yourself.’ Images of arch-cad Leslie Phillips ringing constant doorbells filter through the imagination. Next up is a 10-inch of Stereolab’s most recent album. All the tracks on it were released on a series of six seven-inch singles, given to Shrigley as a gift. Advised that each format came with different tracks, he subsequently bought both the 10-inch and 12-inch versions, only to find the content identical. Fortunately, all are as aesthetically pleasing to look at as they are to listen to. Apart from anything else, Stereolab’s snappy, metronomic way with an artfully realised French language Situationist style slogan might be an aide-memoire for his French. 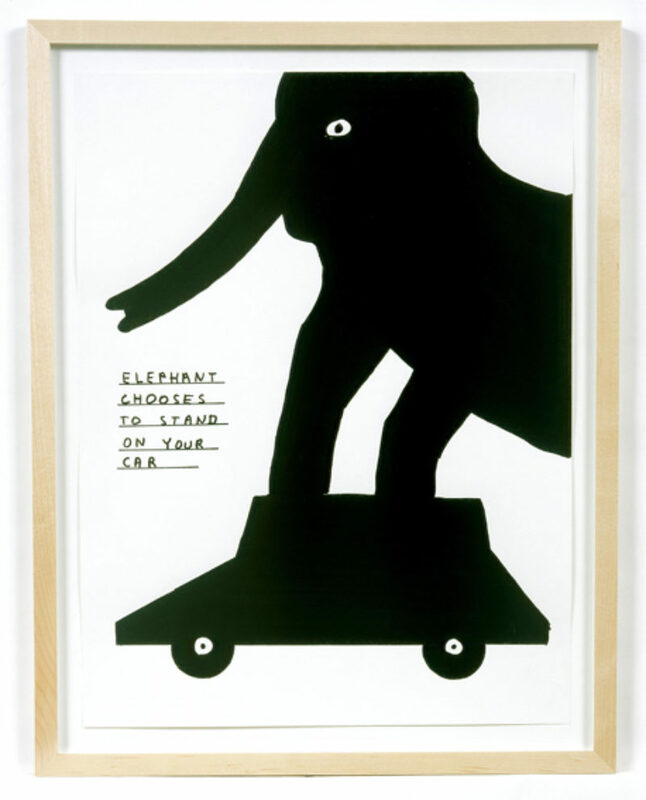 This will be the fourth time Shrigley has shown at Yvon Lambert. He started in the smaller room before graduating to the main space. With the forthcoming show, however, his animation will be screened in the toilet of the centre’s basement bookshop.